To check the serial output from the BLINKY program, connect a serial cable from the COM serial port on the board to an unused COM port on your development PC. Use a terminal emulation program, such as Microsoft Windows HyperTerminal, to display the serial data on your PC monitor. To allow serial output via the UART/USB bridge, remove the BSL jumper if it is installed. To start the Microsoft Windows HyperTerminal application, select Start - Programs - Accessories - Communication - HyperTerminal. 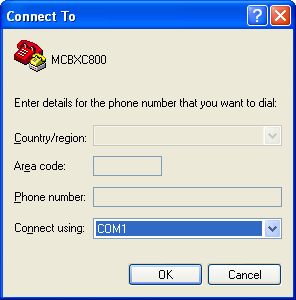 Enter a Name for the new connection, for example: MCBXC800. 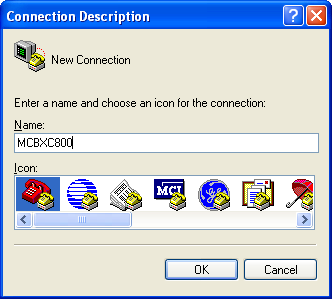 Select the PC COM port COM1 in Connect Using. You must adjust the setting in Connect Using to the COM port that your system actually uses. For the MCBXC88x Board, the COM port may be configured to any channel. 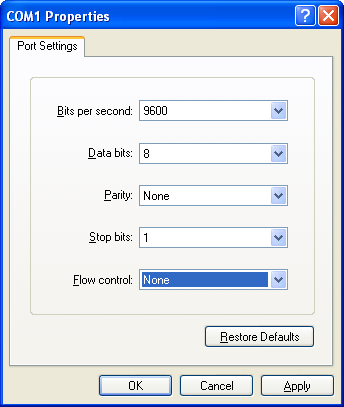 Refer to Configure the COM Port for more information. Select 9600 Bits per second, 8 Data bits, Parity None, Stop bits 1 and Flow control None. Click OK. 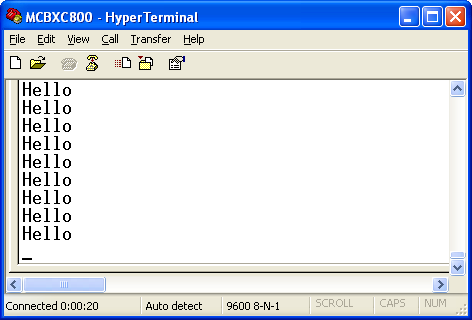 The serial message Hello displays continuously in the HyperTerminal window, as shown below.